In the latest of our My Ministry blog series, we meet Jamie Milliken, a Royal Naval Reservist Chaplain to HMS Dalriada, based in Glasgow. A missionary was speaking on mission work in Haiti and God’s call to be missional Christians. I listened and experienced an almost overpowering sense of the presence of God and a focused call to mission. God is still working on me through encouragements, setbacks, searching and fresh opportunities to serve. The Church of Scotland is very supportive of my ministry to HMS Dalriada, Glasgow which is one of two Naval Reserve Establishments in Scotland and is 30 miles from my parish church. The Unit consists of both Reservist Royal Navy and Royal Marines who attend weekly evening training sessions. 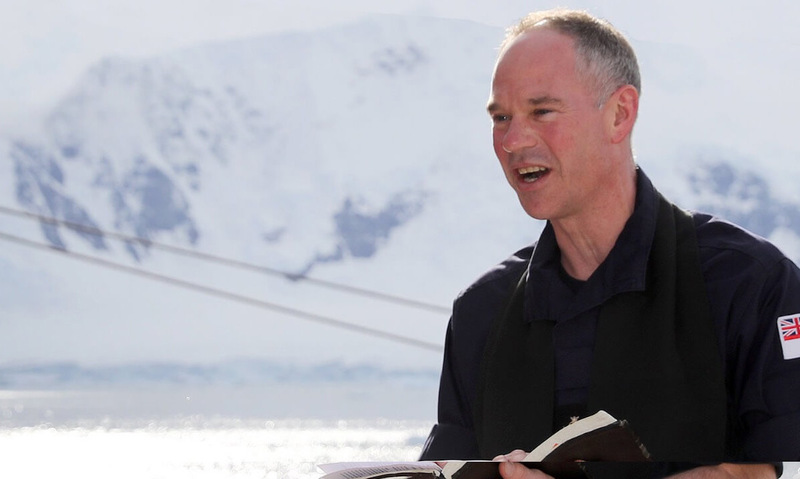 It is a busy Unit with over 100 on Ship’s Company (aged between 16-60) and I have the amazing opportunity to serve locally and internationally as chaplain alongside committed women and men who very often have little or no overt Christian contact in their lives. My role includes being a friend and advisor to all regardless of rank or faith, giving pastoral support and occasionally leading worship. Mostly it is about being available and being incarnational which I find hugely fulfilling; watching and waiting expectantly for God to move and then joining in. Developing wisdom and discernment. The Royal Navy has a well-defined rank structure. Within this the chaplain has considerable latitude to engage at all levels and shape your role. To do so well requires engaging and understanding the lowest rating and the highest ranking officer and then effectively reflecting one to the other. Serving as a police officer taught me self-motivation and discipline, both of which have helped me throughout my ministry. The Royal Navy Leadership Academy is world-class and my leadership skills have benefitted from selected reading and practical leadership training. So far, what’s been the highlight of your career as a Church of Scotland minister? As a police officer my ‘best ever’ arrest was of a well-known dealer for supplying Class A drugs, but he broke bail and went on the run to Spain. Twenty years later I eventually laid hands on him! He was in a group for people who had drug-related problems. I put my hands on his shoulders and prayed that God would speak powerfully through his testimony of leading him away from crime to ‘life in all its fullness’. What’s your message to those considering applying and training for a life in Ministry? I could be retired in two years’ time on a nice police pension, but would have missed all the life-giving opportunities that God has brought my way and the integrity of knowing that I’ve stepped out where God would have me be.